If you are looking to the future, our Summer offer is here to help you plan for every eventuality. Plan a Lasting Power of Attorney to select people to manage your estate if you are unable to do so, due to illness or an accident. Lasting Powers of Attorney now come in two different forms; Property and Financial Affairs, and Health and Care Issues. Whatever your requirements, our specialist team is here to help. 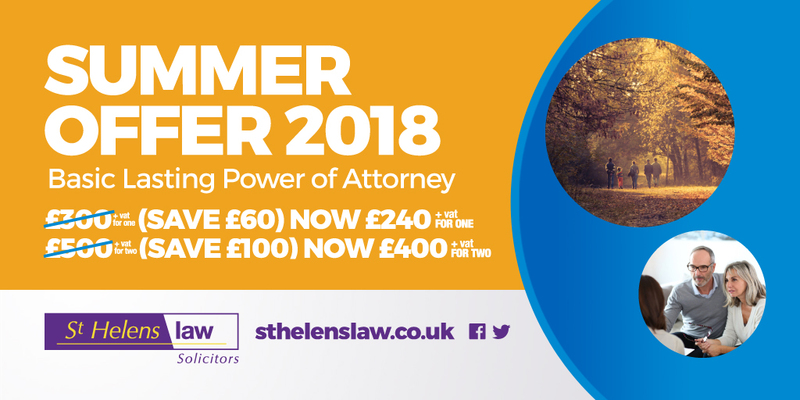 Throughout July and August 2018, basic Lasting Power of Attorney is available at reduced rates of just £240 + VAT for one (normal price £300, saving £60), or £400 + VAT for two (normal price £500, saving £100). For a FREE initial consultation call 01744 454433, or email info@sthelenslaw.co.uk. Or click here for more information on Lasting Power of Attorney. *The Summer Offer and prices shown above are during the months of July and August 2018. The savings shown are against the usual basic LPA of £300 for one and £500 for two. LPAs are subject to a registration fee of £82 per LPA.